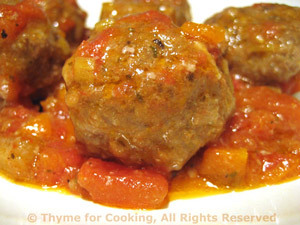 Meatballs, simmered in Osso Bucco sauce, Thyme for Cooking gourmet cooking. I added a a cup of chopped tomatoes to the leftover sauce, and cooked the meatballs in the simmering sauce. In medium bowl lightly beat the egg with a fork. Add breadcrumbs, wine, mustard, ketchup, paprika, garlic, herbs and mix well. Form into meatballs, about 1 1/2 " (4cm) in diameter. In a medium skillet with lid heat the sauce and tomatoes. When simmering add the meatballs, being careful that they don't touch. Cover and continue to simmer until meatballs are done, stirring and turning the meatballs once or twice, about 15 minutes.